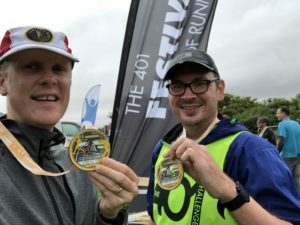 Whilst I ran about 22 miles with a group of awesome people such as Twice The Health and Barefoot Alex, I also met Ben and we got to chatting, he told me about the 401 Festival of Running. 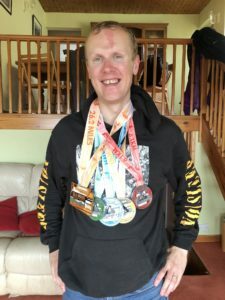 Us runners do love a medal and when he explained there were four races over one weekend and five medals to earn I was already on the hook. There were options of a 5K, a 10K and a Half Marathon and if you wanted to do just one race that was fine. 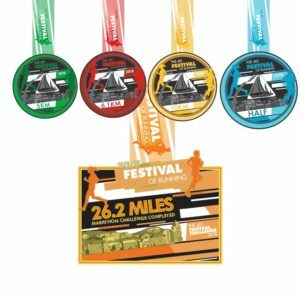 BUT if you took on the 401 Festival 26.2 Mile Challenge you’d do all three, plus a final 6.1 K race to round up to the marathon distance, and all 5 medals would be yours. But other than my own addiction to bling, as Ben told me the reason behind the event that’s what really sold it to me. 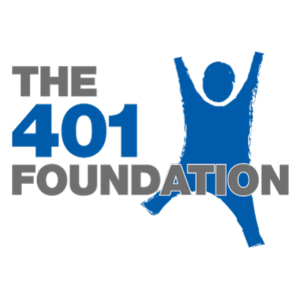 You see after completing his challenge he was already planning ahead to the next project The 401 Foundation. A charity set up to help local projects up and down the UK that help people with mental health issues and self esteem. It’s not something I speak about but I’ve personally suffered with stress and depression in the past, Ben has too and we shared our stories. I think running is good for that, when you’re on a run and chatting away about life’s problems with someone, it suddenly feels a lot better afterwards. Anyway, once I realised what he was trying to achieve I had to be involved and help. 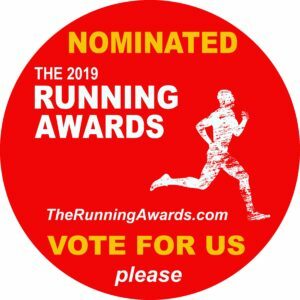 I offered to act as an Ambassador of sorts for the Running Festival, post and tweet about it and generally increase awareness of the event as best as I could, so in the run up to the event I smacked it, and got the word about 401 Festival out there. I was so excited for this event I got myself a new pair of Mizuno Wave Inspire 14 Trainers. The festival is held in Portishead. Maybe you’re like I was saying “where?”. If you are like me you’re missing out on an absolute gem of a place. 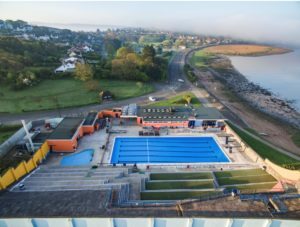 It’s a small coastal town near to Bristol and has an awesome, heated open air pool, at the Lido on battery point, where the race village is. Now when I posted on Facebook about doing the 401 Festival, I received a comment from Sally. I met Sally in 2014 whilst volunteering at the Glasgow Commonwealth Games. 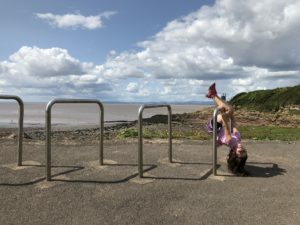 She lives in Portishead and without skipping a beat offered for me and my family to stay over. We arrived on Saturday morning, Sally and her partner Steve had laid on an amazing Breakfast spread for us, settled us in and then took us to battery point where the Festival is held. The first races are just after lunch so there’s plenty of time to travel there on race morning. On arrival I could see that Truestart Coffee were there for all our hot beverage needs and there were tons of people poised to take on the first race, the 5K. OK OK maybe not everyone was 100% focused on running but I was and off we went. The 5K was a lap with a bit of a dog leg to make up distance then a second lap without the dog leg, but at the start was a bit of a hill. It was steep and a couple of hundred metres long. You did half of it to get going, all of it at the end of lap 1 and then the bottom half to come into finish. After this I had a couple of hours off but the 500 metre and mile kids races were to follow. The kids ran their little hearts out and the mile was won in just over 6:30, that’s rapid! After this race I had the Half Marathon to take on, the girls went to the Pool for a swim and loved it. The Half route took you around some lovely coastal housing, around the Portishead Marina where many boats were moored and there was a nice nature reserve too. It was essentially a 10K ish lap run twice. 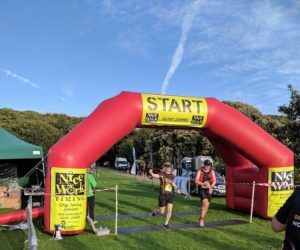 This was great for spectators who could see their runners twice during the race without moving position, and they could enjoy all the quality food an drink on offer in the race village. Twice the Health arrived for this race too, it was great to see Emily & Hannah again. On this run at about mile 8 I met Lee Gregory whom I’d never met before but we got to chatting and ended up doing the rest of the race together. 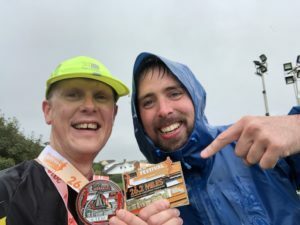 We walked the up hills to save the legs a bit for the following day, and chatted all things parkrun as he’s the event director at Cannon Hill, and as a former parkrun ambassador myself we had loads to chat about which made the last 5 miles fly by. We finished together and Sally whisked us back to hers for a slap up pasta meal (gotta refuel those carbs) and little one settled for bed. 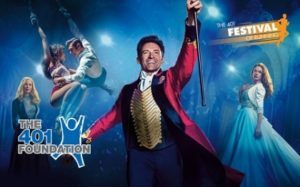 Meanwhile back on battery point a massive screen was set up and a free viewing of The Greatest Showman was on for runners and local residents alike. The following morning Sally did another amazing breakfast spread and fuelled me up for the next race, the 10K. However the heavens opened and the remainder of the Sunday was rain rain rain. I sat in Sally’s living room and did what most runners do, look out the window, wonder why I do this to myself, consider dropping out, thinking of all the plausible excuses I could come up with to drop out that wouldn’t make me look like a wimp who doesn’t like rain, only to conclude that I would most definitely look like a wimp and I couldn’t be that guy that doesn’t finish the 401 Festival of Running and comes away with less than half the medals. So I manned up, had an extra coffee and went for it, Whilst I ran the 10K the girls got back into the pool, I mean they were gonna get wet either way, why not do it in a heated pool. I met back up with Lee and we ran the whole 10K route together. This was essentially identical to the half marathon route but just the one lap. 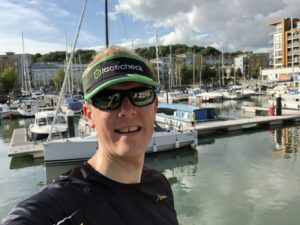 Although it was a repeat of yesterdays route it was good for knowing how far was left, good to see the boats albeit a little wetter than yesterday, and because the race check visor was already sweaty from yesterday it was a good excuse to break out my Comrades hat. Lee and I were soaked but we were one race away from 401 glory. The same 500m and mile kids races went on again, it’s only fair the kids get wet too right? After this race the girls and Sally retreated to the warmth of Sally’s home and I’d lost my support crew. I huddled inside the Pool taking advantage of their cover whilst drinking a hot chocolate. I’d already motivated myself out in the rain once, got soaked, got dry and was fully dressed keeping warm. Honestly it would have been so easy to call it a day, I really didn’t want to go outside and run again. It reminded me of times past, when I was suffering stress, that the simplest takes could seem insurmountable, but I wasn’t going to let the weather stop me. I hadn’t come this far to give up and this was for people with mental health and worse hurdles to overcome. I got back into my running gear and got back up to the race village. Poor Ben was drenched running around in the rain like a maniac trying to pack up as much of the village as possible as everyone else was huddled in small tents just keeping dry until the inevitable soaking on the 6.1K and the rain was getting heavier by the minute. I don’t think anyone “enjoyed” that last 6.1K, it was very much a heads down and get it done scenario. I’d planned to run with Lee again but with the rain and personally an old ankle injury now flaring up I just wanted to get it done. I bid farewell to Lee and I turned on as much pace as I had left to get it done. When I crossed the finish line I was soaked, cold and just wanted to go home. But then I saw all the volunteers stood there, just as wet, probably even more cold and they were still there with a smile and a well done as they handed out medals to the runners. 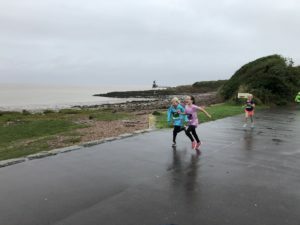 The same is true of all the course marshals they braved the elements too and without them we couldn’t have run, so if you volunteered and you’re reading this, a heartfelt THANK YOU to you. Ben was there to personally congratulate each and every runner, he was wringing wet but still smiling. All in all this was a great weekend. 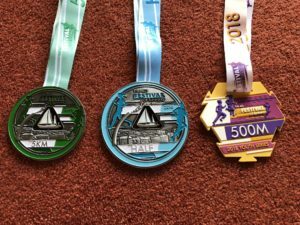 When you look at something like the Great North Run which is close to £60 for one half marathon and one medal, The 401 Festival is a bargain, at £60 for 4 races and 5 medals. 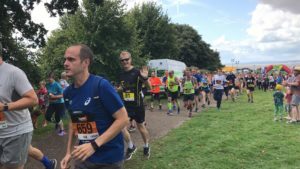 OK it’s not your big city race with tens of thousands of runners, but it was still a couple of thousand runners, all enjoying a collection of races and chatting, making friends and socialising for a whole weekend. 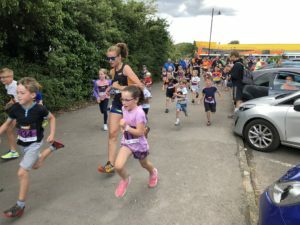 It had a really family feel to it, especially with the kids races and it reminded me a lot of parkrun, in the way that people actually chat and have a laugh, rather than getting a medal and disappearing.